I was literally on a treasure hunt this cold, Spring afternoon as I carefully turned over big pieces of bark and rotted logs, eagerly anticipating whatever I may find. I get to meet the most amazing members of the forest community this way! I am enthralled every single time I play this "game." There is nothing I love more than photographing nature, and there is nothing that makes me kneel to the ground faster than discovering something I've never seen before! I was not disappointed today! I lifted a shred of bark from the cool, moist leaf litter and immediately knew that the tiny, brilliant red dot that accented the dark earth was going to lead me on another adventure into the unknown! I photographed this teeny speck of color as best I could, but since he was only about the size of the point of a pencil, I didn't even know if he would be in focus. Luckily, I got one decent shot. As amazingly bright red as he was, he disappeared like magic into the dull, decayed plant material. This Red Velvet Mite is not an insect, but an eight-legged arachnid arthropod (related to spiders and scorpions). Their legs have a unique arrangement; they are in four sets of two. These mites are members of the subphylum, Chelicerata (organisms possessing tiny lobster-like claws that function as mouth parts). They are found worldwide within leaf litter, under logs, and within the layers of decayed material of the forest and woodland floors. As you can see, the "hairs" on their bodies and legs actually make it appear as if they are covered in soft, red velvet. To begin life, the larvae of this mite hatch from eggs, and survive initially as a parasites, attaching themselves to other arthropods and feeding on their blood. 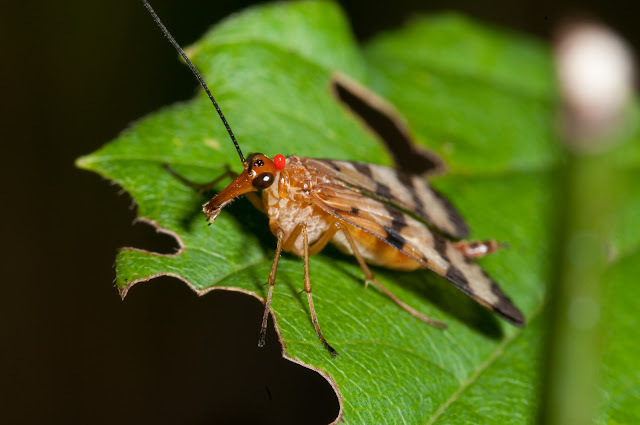 A good example of this behavior is shown in the picture below that I took last summer of a female scorpion fly with a red mite larva attached to the back of its head. The larva depends on a host, but it will eventually mature, detach itself, and make its home in the soil. Once mature and living in the soil, the red velvet mite becomes a predator and will keep busy devouring many species of small insects and their eggs. They can even be cannibalistic, devouring other mites and their eggs. They have very few natural enemies due to their bright red color, which indicates to everything around them how terrible they taste! In fact, experiments have shown that when they were offered as prey, they were either refused or immediately spat out. These mites exhibit an interesting mating behavior...the male will deposit sperm onto leaves and twigs, and then lay down a trail that leads to the sperm. This trail attracts the female, and if she successfully follows the path she will then sit in the sperm. If another male finds a sperm trail that is not his product, he will destroy it and lay down his own to ensure that the next lucky female will be fertilized by him. This behavior also involves a type of mating "dance" with the male and female encircling each other and tapping each other with their forelegs. 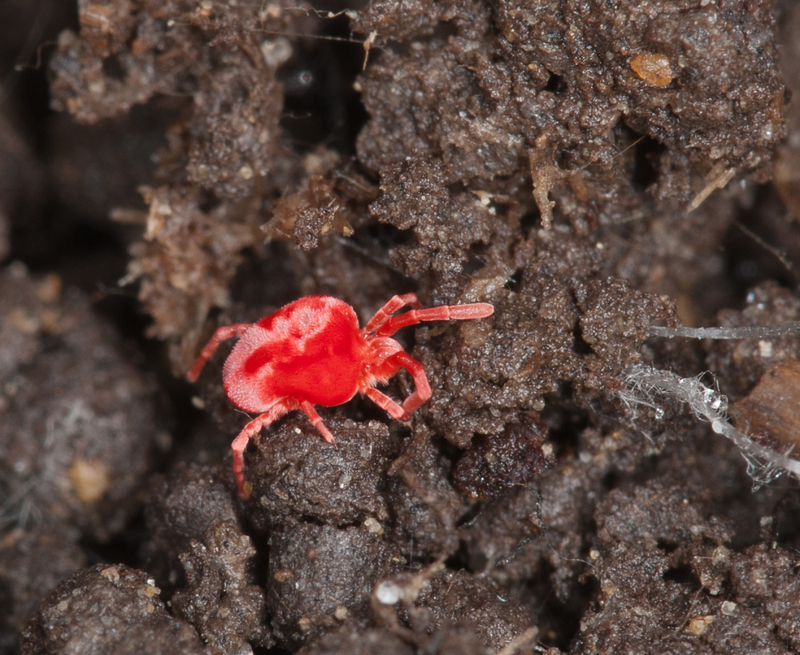 The presence of the red velvet mite is very critical to the environment. I liken their existence to that of "team players"; their role, along with other beneficial terrestrial arthropods, being to participate in the decomposition process within the soil matter, and humus of the forest floor. Due to their parasitism in the larval stage and appetite in their mature stage, they also play an important role in pest control. It is very interesting that such a tiny organism plays such an integral part of maintaining a healthy ecosystem. Late last summer when I discovered the superb camouflage system that a lacewing larva utilizes for survival, I thought it was one of the most ingenious things mother nature could come up with! Well, now that spring has sprung, my camera and curiosity have revealed yet another huge, yet tiny marvel!! Maybe I should have named this post, "The Art of Incognito." Incognito is synonymous with concealed, camouflaged, disguised, hidden, and unrecognized; words that definitely describe the appearance of the fragile Caddisfly Larvae. 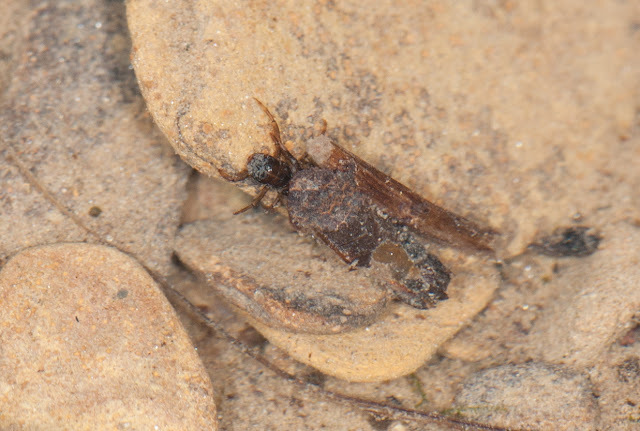 Keep in mind that I have never seen or heard of a caddisfly, but I have done a lot of reading since observing this species in the cold, clear streams at Wildcat Hollow, part of the Wayne National Forest near Burr Oak. First of all, an adult Caddisfly (order Trichoptera) resembles a small moth with long antennas that is mostly active at night. Some have patterned wings, while others are dull-colored. They are attracted to light as most moths are. What I was fascinated with, however, is the larval stage of this delicate little creature. Take a look at this macro shot to see the beauty of the protection plan that this larva has literally put into place. 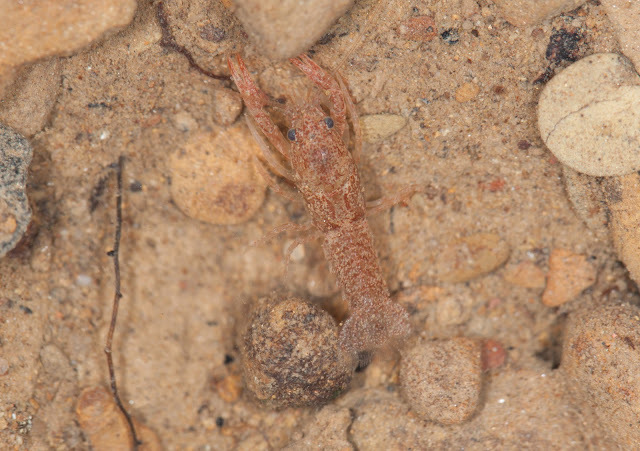 The larval stage is completely aquatic, and this photo shows this particular larva crawling and feeding along the bottom of a stream. (I'm shooting through the surface of the water. The depth was about 5 inches). A Caddisfly larva looks somewhat like a tiny worm or caterpillar. The larvae have devised a system of protection by taking bits of materials from whatever environment they are living in, and constructing a case from those materials, which they will live inside throughout this stage of their life. This casing becomes a mobile shelter. They pull it around with them wherever they go. As you can see, this case perfectly matches their environment, and if you aren't looking very closely, you would never even notice the hundreds of these little guys that may be present. (Believe me, there were hundreds of these little beauties in the streams at Wildcat Hollow). A large population is actually a great thing; it is an indicator of a healthy stream, as they cannot survive in polluted water. The larva constructs the case by first spinning a silken net around their body, which acts like a "glue" to which they can attach materials from their surroundings. (Remember, this is all done under water, and frequently it is rather swift-moving water). This particular little guy has cut up tiny pieces of leaf and bark and overlapped them much like shingles or tiles around the length of his body. The colors and patterns are just gorgeous on some of them! I truly consider them little architects and artists! 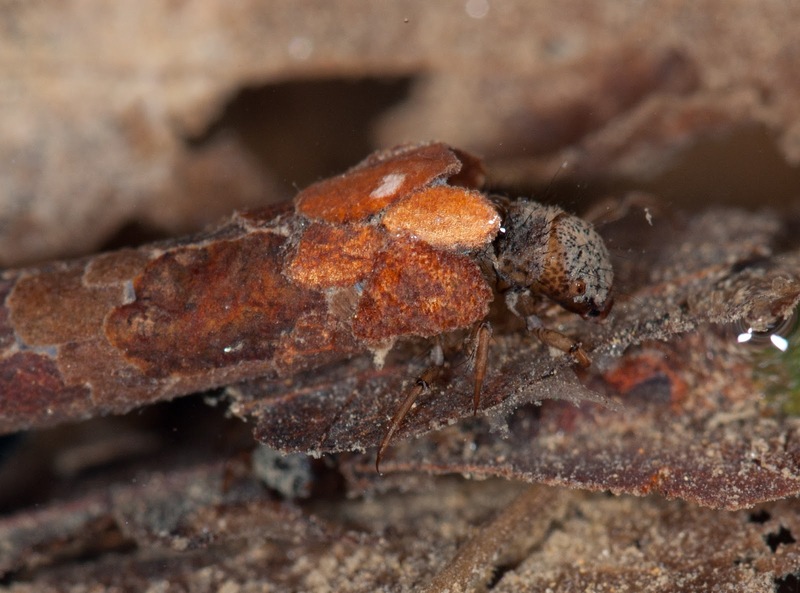 Actually, there are several different species of caddisflies, and they are identified by the materials the larvae choose for their casings. Some use bits of leaves and bark (like the one pictured above), while others use plant material and twigs. Still others will use grains of sand, small rocks and pieces of shells. There is even a species that uses just the silk netting, and one type of species that doesn't use a casing at all. Interestingly, if you take one of these larva out of its case, put it into an aquarium of beads, colored stones, colored sands, etc., it will construct a beautiful casing from these artificial materials! The picture below is of a caddisfly larva with a much more crudely constructed casing. I don't know if he has outgrown his case, or if this is a different species that uses bigger pieces of bark and twigs. The twig along his side was "glued" to the bark on his back in quite a different fashion than the other ones I observed. Indubitably, SURVIVAL is of extreme importance in every species, whether it be plant or animal. Every form of life miraculously has a plan and a purpose. These little organisms didn't even have to complete Survival Skills 101 in order to learn this tactic...it is just the way nature is programmed through evolution. As the larva outgrows its casing, it simply builds another one. It will spend several months, even up to a year in this stage, and then as it begins to reach maturity, it will attach the case to something substantial in the stream, and seal itself up to pupate. After the pupa has developed into an adult, it cuts itself out of the casing and swims or crawls to the surface as quickly as possible (to avoid being eaten). 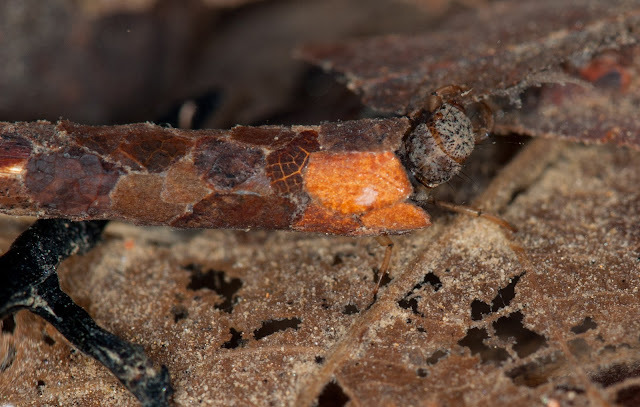 After climbing onto a rock or leaf, the adult sheds its pupal membrane and emerges as an oxygen-breathing adult caddisfly and flies away! The adult then spends most of its short life mating and laying eggs on the water. Needless to say, caddisfly larvae are a very important piece of a healthy ecosystem. The larvae feed on dead plant and animal material in the streams, thus breaking down matter and cleaning the water, and also provide food for fish, salamanders, frogs, and other aquatic organisms. The next time you are around a stream, look very closely for tiny elongated bits of leaves or gravel that appear to be making their way along the bottom. Chances are you will be observing this little aquatic wonder! The streams were certainly busy today, with an abundance of aquatic life forms, including several of these 1/2-inch long "baby" crawfish. They quickly dashed in and out between rocks and submerged leaves as if they were intentionally teasing me! They were almost opaque and just barely discernible against the texture of the rocky stream bottom. They would literally disappear in an instant, and it was a real challenge getting a clear picture of one due to their almost microscopic size and quick as a wink mobility. These freshwater crustaceans, like the other creatures in this particular blog, are also great indicators of healthy streams. They absolutely cannot tolerate polluted water, which says a lot for the streams at Wildcat Hollow since there were LOTS of them! Once you start scrutinizing every tiny little thing in a stream, it is really amazing at the myriad of creatures you will see moving about! Seriously, there are organisms of all shapes and sizes scurrying, swimming, crawling and generally going about their business in this aqueous environment. 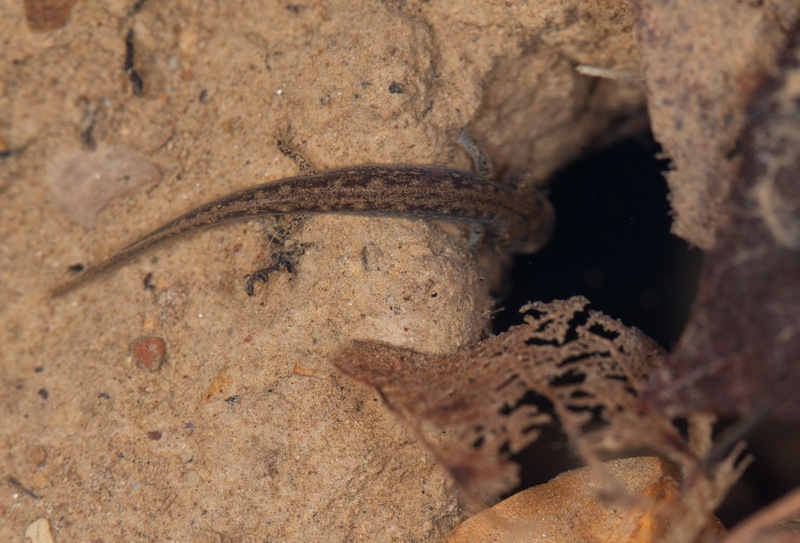 As I was trying to focus on a minuscule crawdad darting about under the rocks, I noticed this salamander peering into a hole in a fairly calm portion of the water. The hole looked deep and black, and the salamander seemed very curious as to what was in it. Luckily the water in these particular streams are amazingly clear. After a few seconds he lifted his head and I could see that he was not yet mature due to the presence of gills on the sides of his head (resembling feathery projections), as you can see on the picture below. I believe this whopping 1 1/2-inch long at best critter, to be a Southern 2-lined salamander larvae. I could be mistaken, but after looking at pictures of all the different species of salamanders that live in streams in Ohio, the Southern 2-lined salamander is what I feel he most closely resembles. There are actually 25 species of salamanders in Ohio, but 10 species utilize the flowing waters of streams, where they will deposit eggs and develop as larvae. Simply getting a picture did not satisfy my need to know more about this miniature vertebrate, so I began my quest to learn more about him. The Southern 2-Lined Salamander is from the family Plethodontidae, or Lungless Salamander. The larvae of this particular species are aquatic and will remain in this stage for up to 2 years, but become semi-aquatic when mature. At this point after metamorphosis, they will lose their gills but will still lack lungs. Respiration is conducted through the skin and specialized tissues lining their mouth. Once mature, the skin of these salamanders must be kept moist, so they live in damp environments and may be found near streams in moist leaf litter, under rocks, decaying logs, etc. The presence of this species and other salamanders can be considered a good indication of healthy streams, ponds, rivers, vernal pools and basically all environments in which they live and breed. 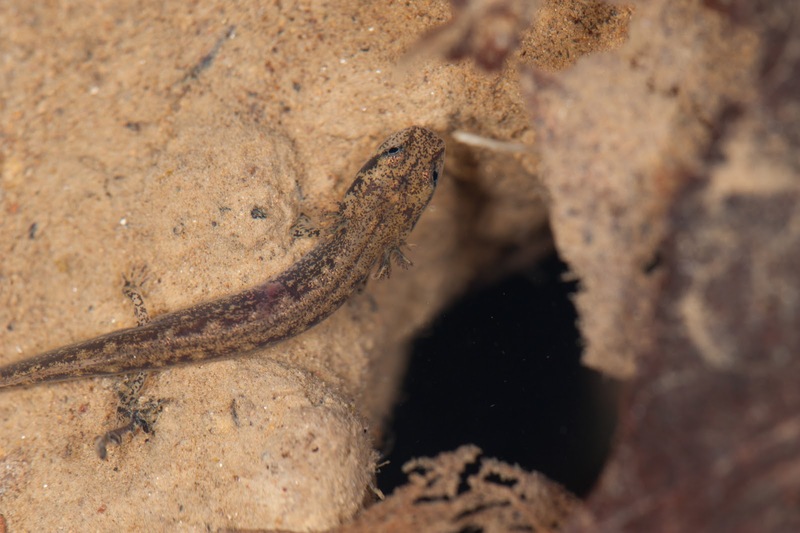 Ohio has a monitoring program in place to study and document the populations of certain species of salamanders to more closely understand how they interact with possible changes in water and environmental conditions. Their population can be threatened if their habitat is disturbed or polluted, so careful monitoring is crucial. Salamanders are also protected by law in Ohio and permits are required for collection or capture. I hope to discover and photograph many more of the beautiful and interesting species of amphibians as spring continues to encourage new life!